Manufactured housing has caught the attention of more and more home buyers in today’s market. For millennials still bearing the weight of student loan debt to baby boomers downsizing as they enter retirement, manufactured homes offer a unique purchasing solution that offers all the attractive qualities of a new home without the site-built price tag. If buying a new home is on your radar, a manufactured home may be an option you haven’t considered. Here’s everything you need to know about manufactured housing, how it’s increasing in popularity, and why it could be the right move for you. Manufactured housing (MH) is a home constructed primarily — or entirely — off-site in a factory or warehouse before being moved to the property where it is set. The homes are constructed in an assembly line over several days to several weeks, depending on the size and customizations of the homeowner. Upon completion, the sections of the home are transported to the home site on a flatbed truck and assembled on a foundation. With rental rates rising across the country, more millennials are looking to become homeowners each year. But today’s site-built market offers limited opportunity to make that a reality. One of the most attractive qualities of a manufactured home is the affordability. On average, these homes sell for about $73,000 compared to $291,874* for a site-built home, largely due to the more efficient construction process. In a factory environment, home builders can closely control all parts of the process and standardize the manufacturing operations to prevent costly mistakes and damages, and avoid delays due to harsh weather elements. Manufactured homes also offer a more affordable cost of living in the long run; equipped with intelligent, energy-efficient features like automatic thermostats, cool roofs, high-end insulation and more. These qualities offer additional appeal to millennials, the most environmentally conscious generation of home buyers. Manufactured homes also offer freedom to customize the home however the owner desires. Floor plans are laid out to maximize space and comfort, with open concepts featuring luxury fixtures and upgrades like hardwood floors, granite countertops, large kitchen islands, and more. For retiring boomers, the opportunity to customize the perfect home in the perfect location for their next chapter is made possible with the affordability of a manufactured home. In total, nearly 22 million Americans live in manufactured homes as of 2018, according to the Manufactured Housing Institute. There are specifically tailored programs to help finance the production and purchase of a manufactured home. In order to make the best decision for your situation, it’s important to understand all of your options. But first, you should know that a manufactured home must be classified in one of two ways: as real property or personal property. Real property shares the same classification as a site-built home, offering traditional home financing or a mortgage loan through a lender or bank. In order to be considered a real property, the home must be permanently installed on the land purchased by the buyer. This means the home meets the manufacturers’, state, or HUD requirements of being anchored to the foundation or ground below the home. Personal property is the same classification that an automobile or household appliance receives. This type of “moveable” property often also applies to homes that are placed on leased land. The good news is that most manufactured homes today are built to qualify as real property, meaning lower interest rates, no matter what your credit score may be. If you own the land where your manufactured home will sit, or where you plan to buy it, you might qualify for an FHA loan. This program insures up to 90% of the loan amount. With low down payments, fixed interest rates, and consumer-friendly rules, these loans are popular among home buyers. FHA loans include the well-known 203(k) loan, which allows the borrower to make a low 3.5% down payment, but which also require an up-front mortgage insurance premium to cover the government guarantee. Your credit does not need to be perfect to qualify, and you are required to buy the land and the home together under the loan. 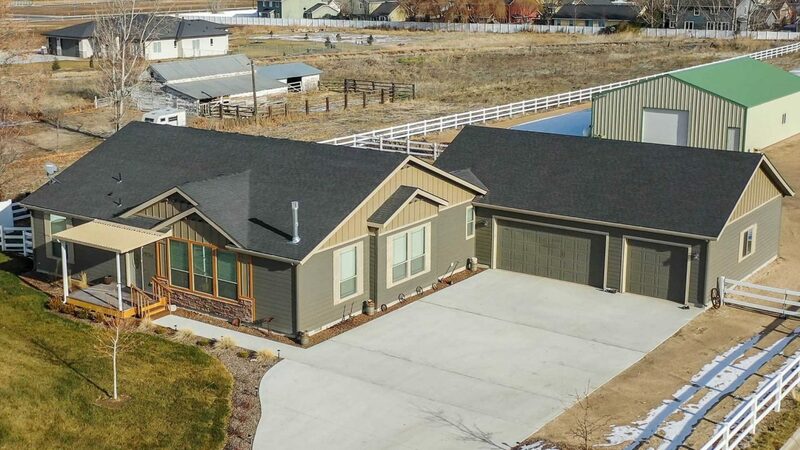 Most people make the connection between the USDA and farmers or agriculture, but the organization offers a number of home loan programs as well — as long as your home is located in a rural area. USDA-backed manufactured home loans offer 100% financing, so you don’t need a down payment. They also feature looser credit and income requirements than most loans, making it easier for more families to secure the financing they need. There are a few additional restrictions involved with the loan, such as the home must be less than one year old, attached to a permanent foundation (and therefore be taxed as a real property) and sit on a site that is owned by the borrower. But the biggest hurdle tends to be finding a lender that not only offers USDA loans but also has extensive experience with them, both of which AFR can provide. Veterans of the U.S. military also have the option to use their home loan benefit to finance their manufactured home. The no-money-down and no-monthly-mortgage-insurance features of the VA manufactured home loan are particularly appealing to buyers. Because of this, you tend to pay slightly more in interest rates, but in many cases, it makes the most sense. Similar requirements to the USDA loans (above) apply, while maximum loan terms vary based on whether or not the home is double-wide and if the lot is also covered in the loan. FNMA (also known as “Fannie Mae”) loans are a lesser-known option for manufactured homes, but are flexible and versatile loans in terms of eligibility and what’s covered. Unlike most loan programs, some Fannie Mae loans allow for luxury improvements and can also be used for second homes or investment properties. The loan is also based on the value of the property after the renovations are made, so borrowers can generally qualify for a higher mortgage. Single-wide and investment properties are not permitted. To learn more about buying a manufactured home, contact the loan specialists at AFR to discuss all the financing options available.